Ryeland sheep are a very old breed, originating in Herefordshire. There are documents relating to the breed that date back to 1343. 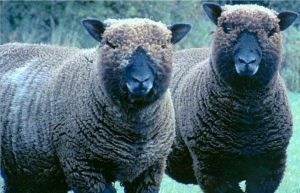 These coloured sheep are polled, with medium-fine wool, and a compact, meaty conformation. Cololured Ryeland sheep provide a range of fleece colours and patterns from palest silver to shades of brown and almost black. The staple is medium/short with lots of crimp. The wool is resistant to felting. It can be hand spun using the woollen process to produce a warm bouncy yarn.